Scary news from the Pittsburgh Penguins: Kris Letang underwent evaluations at a hospital following a Shane Doan hit on Saturday. The Penguins won 3-2 against the Arizona Coyotes, yet their thoughts are obviously with Letang, especially considering his history with head injuries. Doan must be at least a little concerned about a suspension since he’s had run-ins before. Pittsburgh superstar Evgeni Malkin returned to the Penguins Saturday and contributed two assists. Malkin missed six games after sustaining a lower-body injury during his first shift in the Penguins’ 2-0 loss to the Boston Bruins on March 14. 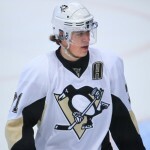 Malkin now has 42 assists and 70 points in 64 games this season. 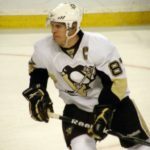 Sidney Crosby is the only player likely to record 80 points this season. With that said, the 2015 NHL season will be best no one as one of the lowest scoring campaigns in the modern era.